Like many manufacturers of relatively undifferentiated products, Novo Nordisk is trapped by a gross-to-net rebate bubble. Its list prices soar, but the net realized price barely budges. Below, I review Novo’s evidence on channel economics and highlight the perverse incentives that keep inflating the bubble. The debate is heating up about the warped incentives baked into our crazy drug channel. I continue to believe that traditional pricing approaches will not survive. Novo even promised that future list price increases will be "no more than single-digit percentages annually." The change will be disruptive to PBMs, wholesalers, and payers. Who knows? Maybe the patients will benefit, too. For better or worse, Mylan CEO Heather Bresch kicked off a national dialogue about drug channel economics when she defended EpiPen pricing. Ms. Bresch pointed out that more than half of EpiPen’s $608 list price is absorbed by the drug channel, which she defined to include PBMs, insurers, wholesalers, and pharmacy retailers. See EpiPen, Channel Economics, and the Great PBM Rebate Debate. Novo Nordisk provided its own version of the gross-to-net channel flow in the following “List Price vs. Net Price” chart. Novo’s chart is an accurate but incomplete depiction of a manufacturer’s channel economics. The chart implies that each of the three categories—Rebates/Discounts, Wholesaler Fees, Additional Price Concessions—get an equal share of the gross-to-net spread. In reality, most of the money went to commercial and government rebates, not to wholesalers and copayment assistance. Drug Channels frequently points out that the manufacturer’s published list price does not equal the net price received by the manufacturer. Refresh your memory with Follow the Dollar: Measuring Who Profits From a Brand-Name Prescription. Consider the data that Novo shared about the pricing history for two key insulin products. 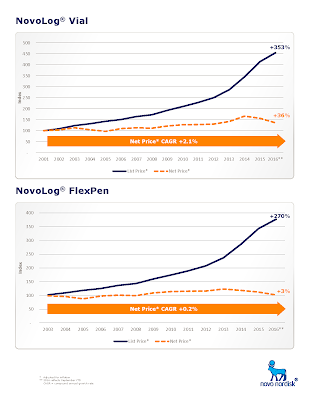 The list price of its NovoLog vial grew by 353%, while net price grew by 36%. 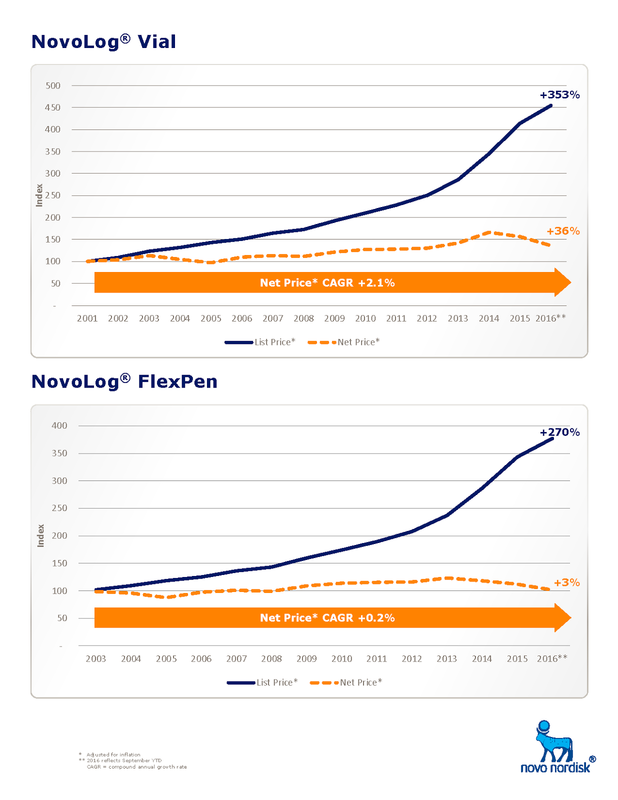 For its FlexPen, list price grew by 270% while net grew by only 3%. These charts echo a recent Wall Street Journal article that examined the vast and growing discrepancy between a drug’s list price and the manufacturer’s net prices for insulin. (See Insulin Prices Soar While Drugmakers’ Share Stays Flat. ) The data are also consistent with the EpiPen trends shown by CVS Caremark in its EpiPen: What You Need to Know white paper. 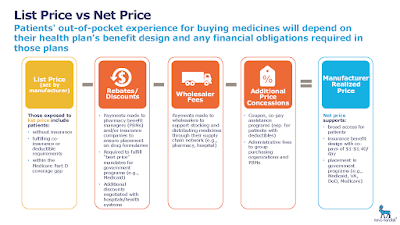 When the patient is exposed to the list price, the PBM and plans can still collect a rebate and admin fees that are not reflected in the retail pharmacy price. That’s a big problem, as Matthew Harper at Forbes addresses in The Insurance Rip-Off At The Heart Of The EpiPen Scandal. "For Novo Nordisk, those price increases were our response to changes in the healthcare system, including a greater focus on cost savings, and trying to keep up with inflation. 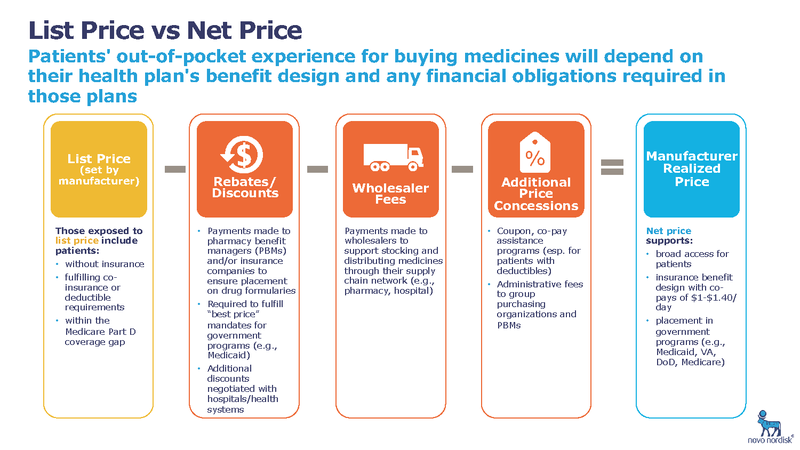 PBMs and payers have been asking for greater savings – as they should. However, as the rebates, discounts and price concessions got steeper, we were losing considerable revenue – revenue we use for R&D, sales and marketing, education, disease awareness activities and medical information support. So, we would continue to increase the list in an attempt to offset the increased rebates, discounts and price concessions to maintain a profitable and sustainable business. We also monitored market conditions to ensure our prices were competitive with other medicines as part of our business model." Put another way: Our current drug channel system encourages ever-higher list prices—even when the net amount received by a drug maker is stable or even declining. As the list price rose and rebates grew, Novo ended up paying more and more rebate money into the health insurance system. Employers used these extra payments to offset costs in any area, including hospital and physician payments. Health plans used them to reduce premiums and also offset other healthcare costs. PBMs retained a portion of these rebates as their profits. Other channel intermediaries benefited, too. John Hammergren, chairman, president, and CEO of McKesson, explained why wholesalers want brand-name drug prices to go up. As I noted in my discussion of his comments, McKesson plans to go after manufacturers that decide *not* to increase their list prices. See What McKesson’s Profit Warning Means for Manufacturers and Pharmacies. BTW, I still don't understand why Hammergren thought it was wise to brag about liking drug price inflation. Alas, systemic change to pop the gross-to-net bubble will be incredibly difficult. Financial flows and channel business models are built almost exclusively on the Wholesale Acquisition Cost (WAC) list price. Any individual manufacturer is a small portion of drug channel revenues, so none can unilaterally drive major system change. Novo's statement that it would limit list prices is an intriguing first step. But if you’re expecting rapid change, then I urge you to remember Hofstadter's Law: It always takes longer than you expect, even when you take into account Hofstadter's Law.